She has helped thousands of others achieve outstanding results using her unique no-fail formula for success that has been honed to perfection over 30 years. Helping others achieve naturally beautiful results is my business – whether you’re a Superstar or you just want to look like one! Results are the most rare and desirable: Fresh & natural-looking with no visible scars or evidence of surgery. I’m committed to helping my clients achieve naturally beautiful results and optimum health. Over more than three decades I’ve amassed a vast amount of hard-to-acquire inside information combined with extensive personal and professional experience no one else on the planet has. Therefore I continue to consistently achieve only the very best results, as do my private clients. We have no intention of “growing old” as defined by previous generations. I grew up in rural Ohio USA, moving to London in 1977 to further my art studies on a Harvard University student exchange program. Arriving with just 2 suitcases and $600, I worked my way through art college then furthered my studies with auxiliary courses. In the 1980s I decided to use my art training to reinvent myself with a younger, more attractive exterior that better matched how I felt inside. My approach was both artistic and scientific. I applied the classic principles of beauty from my art studies – including nature’s own universal equation for perfect proportion – together with the laws of anthropological laws of attraction. Working from the list below, I drew up a plan. No one had ever done anything like that before so I had no role models to follow. Despite the astounding amount of contradictory, confusing and misleading information I encountered, I was determined to reach my goals and never gave up. During the process I gained invaluable inside knowledge about what works and what doesn’t, how to find the best doctors, ways to ensure that surgery never goes wrong and the secrets of achieving the very best results in the safest, most cost-effective manner. I’ve successfully undergone numerous procedures and single-handedly redefined the boundaries of anti-ageing and aesthetic medicine. Here’s a lighthearted 30 second animated film that illustrates how I used plastic surgery to change my looks and my life. I think it about sums things up! You can see my many changes over the years from various angles below. Above you can clearly see the “dents” on either side of my mouth that have often been mentioned (even on Good Morning America) when others try to find fault with my surgery. In fact they are the ONLY original feature on my face: the dimples I was born with! Age 4 back on the farm. A lot has changed, but not the dimples! With laser-beam precision, she has repositioned tissue, cartilage and bone to transform herself into one of the most desirable women of the late 20th century. She altered her appearance with plastic surgery, emerging as a kind of self-proclaimed test of the correlation between looks and success. A true scientist behind a beautiful mask. A woman that has everything going for her. She is very bright, very accomplished and very successful. Cindy is sitting opposite me… With her blonde hair, her pouty lips, and her cute button nose, I have the weird sensation that all my sexual buttons are being pushed. Which of course they are… Beneath that plastic façade is an extremely intelligent woman. You’ve seen her on television, you’ve seen her in all the newspapers and repeatedly on This Morning, but Cindy Jackson in the perfect flesh still comes as a surprise. She is much slimmer than you expect and much, much prettier. Not Bionic Woman, not a Barbie doll, but intelligent, direct, engaging and, here’s the paradox, real. Her youthful looks and superb body have little to do with Mother Nature. On meeting Cindy, her cool blonde perfection is intimidating. But as she starts talking, it’s clear she’s still an unaffected small-town girl at heart. For Cindy Jackson, the high priestess of cosmetic surgery, the pursuit of perfection transformed her from nerdy nobody to one of London’s most beautiful sirens. Cindy truly is the ultimate makeover. Some people who’ve had cosmetic surgery look grotesque. Cindy looks great. She has a beauty queen’s face that won’t fade with time or dull from a dazzling socialite lifestyle. Her treatments read like a cosmetic surgeon’s manual. The details of which would make your blood curdle. It took determination – and a lot of money – to turn Cindy from an average looking woman into a head-turning stunner. 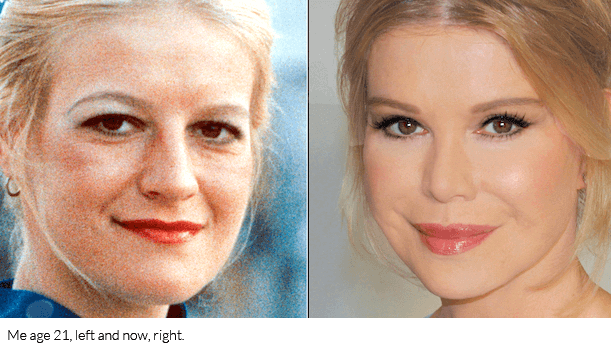 Undergoing everything from facelifts to liposuction to nose jobs, she transformed herself from a plain Ohio farm girl to a glamorous beauty. Her metamorphosis began in 1988. From that point on, Cindy began to completely redesign her face and body… A living breathing doll brought to life by a surgeon’s scalpel. Todd Richard Newton, Plastic Surgery on E! She has a Barbie doll body and a Hollywood face. She has a perfect face, a perfect figure and she looks about 30 years younger than her age. Her image is so smooth and seamless you would think she was the original, carefree natural beauty. This blonde stunner who is now the toast of the London party circuit was once a frumpy US farm girl. Hers is the modern fairy-tale of the archetypal ugly duckling who was determined to be a swan… She is quite open about her odyssey for a complete aesthetic overhaul. 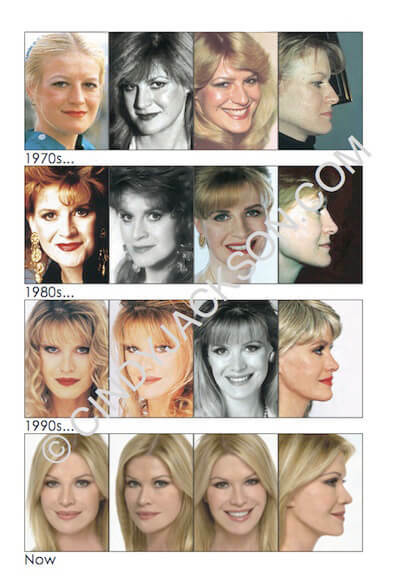 The best facelift I have ever seen, two nose jobs, eye operations,Botox injections,a permanent lip enlargement and fat-filling procedure, three chemical peels and a dermabrasion, two breast operations and four liposuctions later, the plain girl from Ohio looks Barbie-pretty – highlighted blonde hair, picture-book profile, sleek limbs, hourglass figure. Is Jackson’s quest to make herself physically attractive extreme? By everyday standards, yes. Is it entirely misguided? Perhaps not. Research demonstrates that it pays to be physically attractive. A woman who looks decades younger than her age with a towering intellect with a true understanding of human behaviour. Cindy’s real-life perspective is amazingly consistent with volumes of scientific research conducted by top scholars at universities around the world. Cindy Jackson has taken her innate brilliance and raw courage and sculpted a Botticelli. She is magnificent. Dr. Stephen Marquardt, Originator of the Golden Mask that mathematically quantifies beauty. Since 1988 she has had just about every op going to transform herself from farm girl to blonde bombshell… Living doll Cindy boasts an IQ of 164 and Mensa membership to counter any bimbo image. This is not a stereotypical ditzy blonde. She’s incredibly bright and has been very calculating about making these changes to transform her life. Frequently described as Barbie-made-flesh, it is a grave mistake to assume that she is in any way Barbie-brained. Unique in having lived with two faces, she is under no illusions as to which has given her the most power. Any theory that personality can sometimes win the day is swept away as grown men literally dribble in her presence. The result is stunning. Ms. Jackson looks 25 and only has to step outside her luxury Melbourne hotel to turn heads. During our interview that night I never felt so ugly in my entire life as I witnessed man after man coming up to Jackson and telling her that she was the most beautiful woman he ever saw. Not a single man even glanced at me as I was sitting at Jackson’s side. It was a humbling experience for me to say the least. I saw a confidant Yuppie visibly shake as he gave her his card. I saw a cocky rapper bedecked with gold jewellery go completely gaga over her. It was then and there that I became a believer in Cindy Jackson. She looked better at 35 than she did at 25, and even better in her 60s than she did at 35. Before I met Cindy Jackson, I would never have believed it possible for anyone to actually get younger-looking by the decade. I first interviewed Cindy about seven years ago, just as her won remodeling programme was beginning to earn her a certain celebrity. Since then I have become older, fatter and balder. Cindy has been moving in the opposite direction. She is even more physically delicate and her face seems neater and prettier than before. Hyperfeminized, hyperbuffed surfaces aside, it’s Cindy’s spirit that’s lovable. 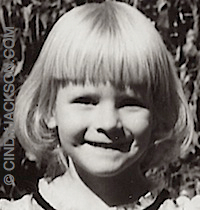 Surgery hasn’t obscured the bookish farm girl with wild dreams. Cindy had a lot of things stacked against her apart from her disadvantaged childhood… After years of watching silently from the sidelines, she was aware of the power of beauty. Like a modern day Eliza Doolittle, the unloved and unpopular Cindy deliberately turned herself into a beauty to live the life of her fantasies..The new Cindy lives a charmed life. I thought she was pretty before. Me, Age 6. Never lose sight of your dreams, no matter how impossible they may seem!